I have the worst posture since becoming a mom. Is it because I’m too tired to hold this body up? Could it be the lack of core strength? Or is it like gray hair and wrinkles–showing up when you reach a certain age? Probably all of the above. Whatever the reason, I’m sick of it. When I notice that I’m slumped over like a deformed creature who lives in a bell tower, I straighten up –pushing my shoulders back and holding my head high. It lasts for maybe a minute before I’m back to Slouchy McSloucherson. At the rate I’m going, I’ll have the biggest hump of all the gals in the resthome. Hopefully I’ll have my own teeth to offset it. Sitting up straight could be the easiest way to “lose” ten pounds, but just because you reposition the rolls doesn’t mean they’re gone…sadly. 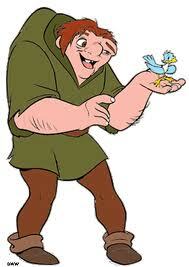 Guess I’ll have to figure out how to rock the hunchback look. A cute little bird in your hand (or in my case, my adorable daughter) just might do the trick. There is a device you can buy that you pin to your shirt at the front of your shoulder, and it beeps when you slouch. I have seriously considered buying one, but then I think that there is enough annoying noise in my house. I’ve never heard of something like that. I definitely need it, but it would be beeping all day if I wore it and you’re right, it would be very annoying. hehehe! Cut ourselves some slouch indeed. : ) Made me smile. You’re so right — posture isn’t on my list of priorities right now.